We are located on the northwest corner of Main Street (131st) & Rangeline in Carmel. If you are coming from the Monon Trail, head east two blocks on Main Street and keep an eye out for us on the left side of the street. We have a black awning over our storefront and patio furniture outside with Abita umbrellas. 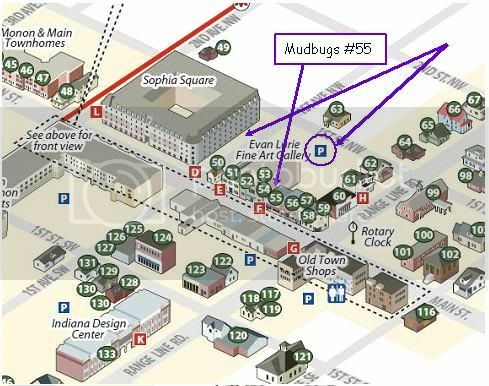 Mudbugs is #55 on the map. Underground parking is available at Sophia Square (just completed) and the Indiana Design Center (#133). Street level parking is available on Main Street, behind Mudbugs and behind most of the buildings on Main Street.